Is it possible to connect iPad Pro to PC? Yes but not automatically. You can use Apple AirPlay iPad Pro to PC powered with Windows 10/8/7. Video AirPlay from iPad Pro to PC expands HD vision, and you can even control the video playback of filming streaming iPad Pro. Switch a tool and make your video AirPlay more professional! How to Connect iPad Pro to PC to Stream Video Music? Windows users can now embrace video music AirPlay iOS10 iPad Pro to PC! A free software is here to set up your Windows PC into an wireless receiver to AirPlay from iPad Pro. On the same computer, 5KPlayer is the first to access Apple AirPlay streaming technology from Windows PC. When your iPad Pro Air/Pro/Mini can connect to Apple TV (Apple TV 4) without external help, a Windows PC doesn't recognize an iPad Pro, iPhone or other i-Devices instinctively. Feature 3: Access iPad Pro from PC remotely: Adjust color contrast, add subtitles or deinterlace videos accordingly. * Multi-screen AirPlay is unique of the paid X-Mirage and Airserver, you may choose it if this is your serious concern. Downloading takes time and storage, hence you can not only stream video iPad Pro to PC, but also AirPlay the video APPs on iPad Pro. It's incredibly easy to replicate and AirPlay YouTube videos from iPad Air/Pro/Mini to a PC screen, and without doubt, it's awesome! Whilst film streaming iPad Pro, you're free to hold on to a Facebook chat or Twitter, without missing a single phase in the film. How to Set up AirPlay iPad Pro to PC to Stream 4K Movies? Download 5KPlayer, install and launch it on your Windows PC. Note it also works fine on Mac El Captain. Step 1: Connect iPad Pro to PC to stream movies videos on iPad Pro. * Please check that your iPad Pro and PC are connected to the same Wi-Fi or Ethernet. 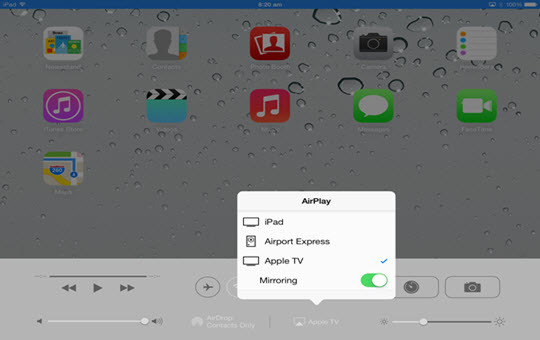 Step 2: Slide from the bottom of iPad Pro screen for AirPlay button, choose your PC. * This AirPlay receiver is a two-way server, it also works perfectly if you want to AirPlay files from PC to Apple TV. * Tap the movie to AirPlay iPad Pro to PC powered with Windows 10/8/7. * When you connect iPad Pro to PC successfully, just turn to other tasks on iPad Pro without missing a single plot of the movie AirPlay from iPad Pro. * Play the YouTube video in full screen, and you will find the AirPlay icon on the top left, click to enable AirPlay on iPad Pro. iPad Air/Pro/Mini itself is a huge collection of your photos and you can AirPlay Mirror these photos from iPad Pro to PC as a slide show with 5KPlayer. * Connect iPad Pro to PC, all into the same Wi-Fi, then find your PC name after tapping the AirPlay icon on iPad Pro, opt "Mirroring" on. * Everything on your iPad Pro screen can now project to PC, including photos or APPs, then go to the album settings to start a slide show. How to transfer/copy videos from iPad Pro to PC to make room, in case you'll need more storage for other tasks? Method 1: YouTube videos can be downloaded to Windows PC via the multi-purpose AirPlay receiver, as long as you can watch them on iPad Pro. YouTube download module through several upgrading proves to reach a remarkable download speed, faster than your uploading a video from iPad Pro to PC via USB cable. Method 2: Download iTunes, connect iPad Pro to PC via a USB cable, then use iTunes to sync. 5KPlayer as a freeware can AirPlay iPad Pro to PC in UHD video streaming, it's an AirPlay sender and receiver to stream video music from PC, Mac to Apple TV. Compared to Kingsoft, Microsoft Office undoubtedly obtained more popularity, so does the Windows OS to Mac OS X, then why not take advantage of them both? Use this freeware, because it renders equivalent AirPlay experience of Apple devices for Windows PC users. Learn the easiest way to screen share iPad Pro with PC/Mac + projector with a free tool. How to Use AirPlay on iPad Pro iPhone? Here a detailed guide on how to use AirPlay on iPad Pro iPhone as well as AirPlay iPad Pro iPhone is shared.